This 1000 horsepower locomotive emerged from Alco’s factory in November of 1951, with builder number 79577. It got its start as Lake Superior & Ishpeming 1002, hauling iron ore in Michigan. 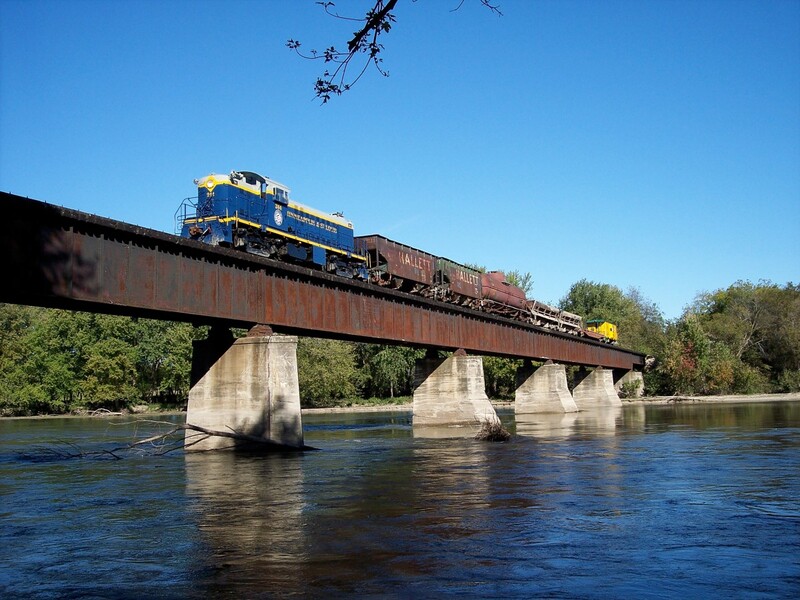 In 1967, the locomotive was purchased by the Calumet & Hecla Railroad, and was renumbered 205. After its retirement from ore service, it was purchased by the Continental Grain Company (by at least 1975) in Pickering, Iowa, where it was used to switch cars at their facility south of Marshalltown, Iowa. In 1996, it was donated to the Iowa Railroad Historical Society. 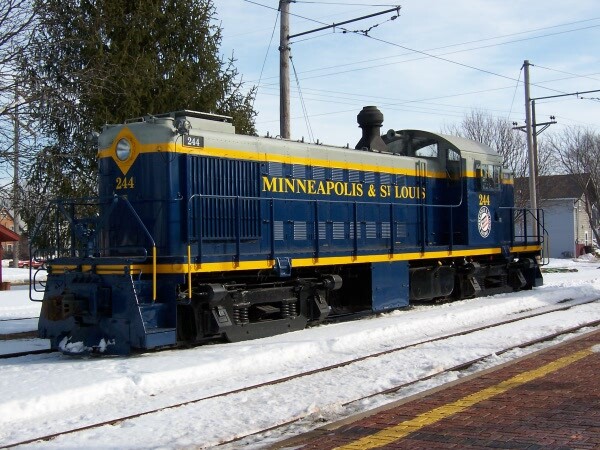 Now painted and numbered for the Minneapolis & St. Louis, 244 is one of the locomotives used to power our Monday through Friday, and Sunday excursion trains to Fraser. The 1003 was purchased from the Chicago & North Western Railway in March of 1986. Also included in the purchase was TR2B 1103, but more on that in a moment. 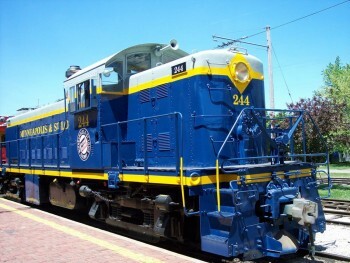 1003 was released from EMD’s factory in March of 1942, with the serial number 1553. It first saw service on the Canadian National Railway’s subsidiary Grand Trunk Western as number 7914. 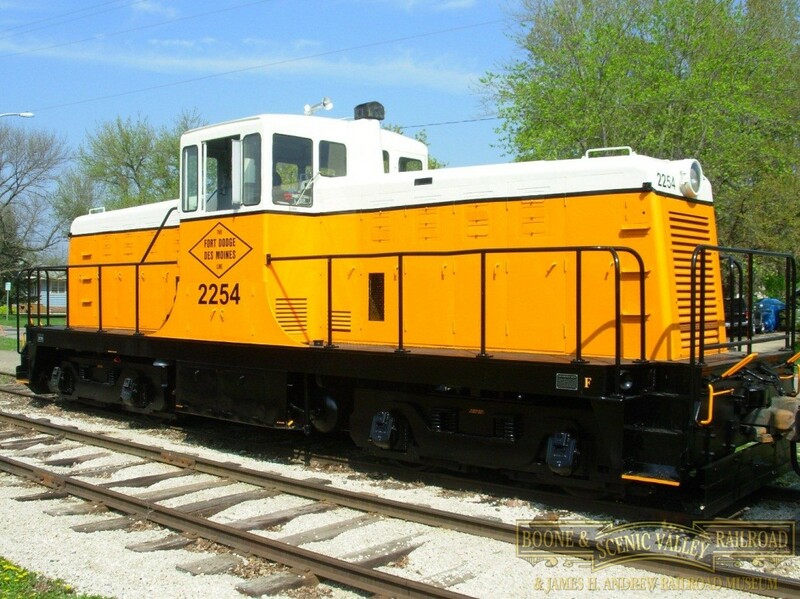 In the early 1970’s the Grand Trunk Western retired the locomotive, and it went to Precision National Corporation in Mount Vernon, Illinois, a company which sold and rebuilt used equipment. In 1973, the unit was sold to the Chicago and North Western Railway. 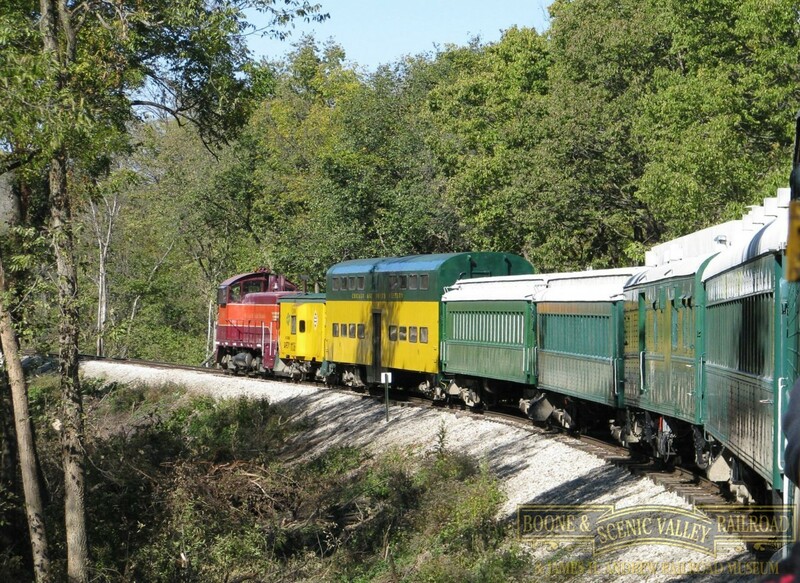 In March of 1986, the Chicago and North Western sold the 1003 to the Boone & Scenic Valley Railroad. Included in the purchase from the Chicago and North Western was a TR2B, number 1103. 1103 cannot be used on its own, as it does not have controls or a cab. Its sole purpose is to provide extra pulling power when tethered to another unit, such as 1003. 1103 began life as Chicago Great Western #65B. Built in August of 1949, it has a serial number of 6892. It became a part of the Chicago and North Western Railway when the Chicago Great Western was purchased by the “North Western” in 1968. This 1000 horsepower locomotive was released from Alco’s factory on March 30, 1942, with the serial number of 69662. 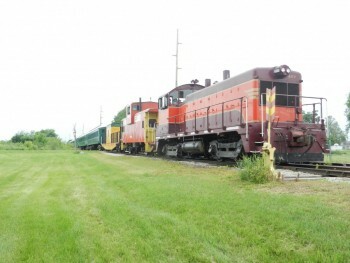 It was purchased by the Terminal Railroad Association of St. Louis, and operated for them as number 575. TRRA’s purchase price for the locomotive was $79,935.00. 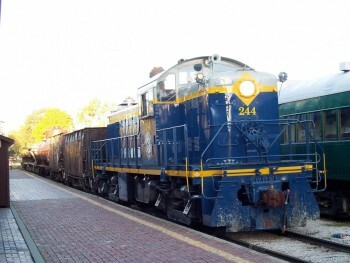 After its life on the TRRA, the locomotive was purchased by RELCO, a locomotive and railroad equipment leasing company, and given the number 1031. It headed to ADM in Denison, Iowa, where it switched cars at their grain elevator. 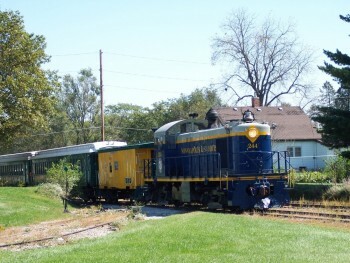 In 1997, 1031 was donated to the Iowa Railroad Historical Society by ADM. The Union Pacific Railroad was instrumental in moving the locomotive to Boone. Therefore, when the time came to repaint the locomotive, it was painted into the Union Pacific’s well-known colors. In October of 1998, the locomotive emerged from the Boone & Scenic Valley Railroad’s shops as Union Pacific 1098. That number is significant in that it signifies the date the locomotive was returned to service. Even though the locomotive never belonged to the Union Pacific, the number 1098 also fits into the series of numbers the Union Pacific did use for that particular model. Built in 1944, this unit was used to switch cars at the coal-fired Iowa State University power plant in Ames, Iowa. When the university began receiving shipments of coal via truck, the unit was placed on loan to the Boone & Scenic Valley Railroad. In honor of the Iowa State University, the locomotive was painted in their colors of cardinal and gold. Presently, the unit is mainly used in spotting the trolley for its weekend operations. Originally numbered 7858, this unit was built for the US Air Force in 1942. In 1983, the Air Force deemed the locomotive as surplus, and it was purchased by the Boone & Scenic Valley Railroad. The unit was a “good fit” for our railroad, as the Fort Dodge, Des Moines and Southern Railroad, one of our predecessors, owned and operated very similar locomotives in the 1950’s and 1960’s. In 1984, the unit was repainted, and renumbered 2254. 2254 was the number of people who came together in 1983, and purchased charter memberships in the Boone & Scenic Valley Railroad, saving this eleven mile section of trackage from abandonment and dismantling. In 2012, the unit was repainted into a paint scheme well-known to many along the Fort Dodge Line (and other Salzburg family-owned lines of the time). Providing 500 horsepower, 2254 remains in active service, used mainly in work train service, moving cars of ballast and riprap along the line. Union Pacific #2921, a SD40-2T, was built by Electro-Motive Division (General Motors) in June 1979 for the Southern Pacific Railroad. Its original number when used on the Southern Pacific was 8385. There were 312 of these “tunnel motors” produced by EMD from 1974 – 1980. The major difference between these locomotives and a standard SD40-2 was the low intake for engine cooling air located near the rear. This area somewhat represents a cage as you view it today. These locomotives were also referred to as “snoots” due to the long nose. The nose of 2921 measures 123” long, and was built to house radio-control equipment, known as Locotrol. This allowed the unit to be used as a helper to assist trains over the mountains of the Southwest. When the Union Pacific merged with the Southern Pacific, the locomotive number was changed from SP 8385 to UP 4476 in January of 1999, then to UP 2921 in June of 2001. The locomotive had faithfully served the Southern Pacific and Union Pacific Railroads for over 2.5 million miles. In 2007, the 2921 had been all across the former SP line, making the trip from California to Texas and back several times. The Union Pacific Railroad retired 2921 on December 5, 2008, and in February of 2010, the Union Pacific donated 2921 to the Boone & Scenic Valley Railroad and Museum. On March 18, 2010, the locomotive was brought onto the B&SVRR by rail, where she is ready to operate for many more miles in the future. This locomotive was built by GMD Canada in 1958, and received by the Canadian National in June of that year. In later years, the unit was utilized by Canada’s VIA Rail passenger system, until its retirement in 1991. 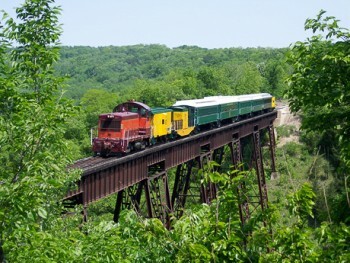 In 2002, the unit was purchased by the Boone & Scenic Valley Railroad, and painted into a Chicago & North Western-inspired paint scheme, while retaining the number 6540. 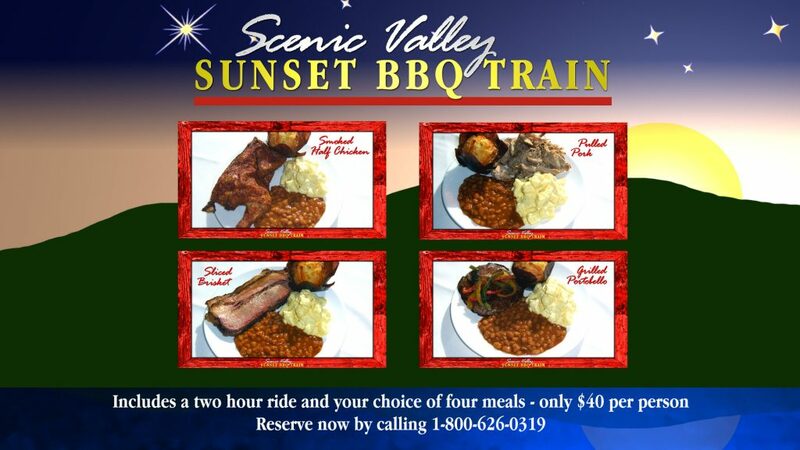 The unit is used to power the Boone & Scenic Valley Railroad’s dinner, dessert, and picnic trains.